A Game of Strategy, Intrigue and Succession. 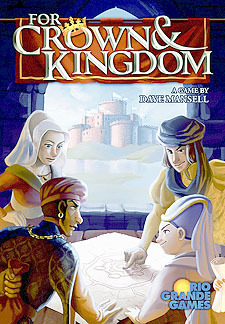 In For Crown & Kingdom, players must use their teams of specialized emissaries to travel the kingdom, raise funds, obstruct opponents, and gain the support of the people. The first duke or duchess to gain support in every region will become the new monarch.